Healthy Bodies unit 3. Body Temperature 1. 1. 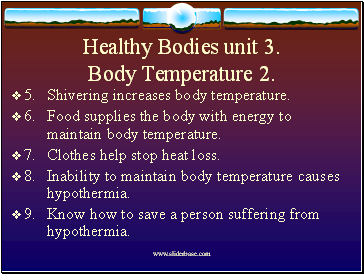 Know what body temperature is. 2. Know that this is usually higher than the surroundings. 3. 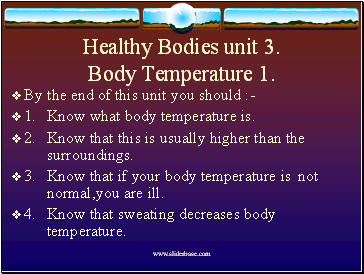 Know that if your body temperature is not normal,you are ill.
4. Know that sweating decreases body temperature. Healthy Bodies unit 3. Body Temperature 2. 5. Shivering increases body temperature. 6. Food supplies the body with energy to maintain body temperature. 7. Clothes help stop heat loss. 8. 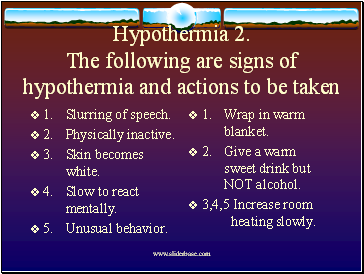 Inability to maintain body temperature causes hypothermia. 9. Know how to save a person suffering from hypothermia. 1. 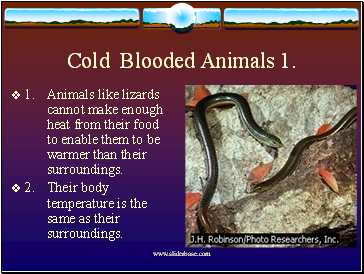 Animals like lizards cannot make enough heat from their food to enable them to be warmer than their surroundings. 2. Their body temperature is the same as their surroundings. 3. They tend to be more active during the day. 4. 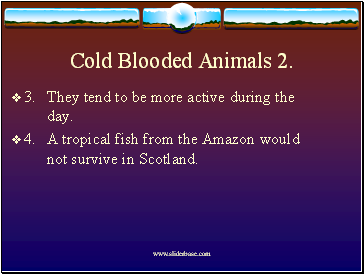 A tropical fish from the Amazon would not survive in Scotland. 1. 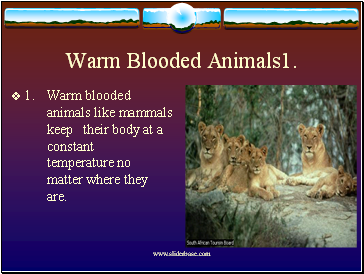 Warm blooded animals like mammals keep their body at a constant temperature no matter where they are. 2. 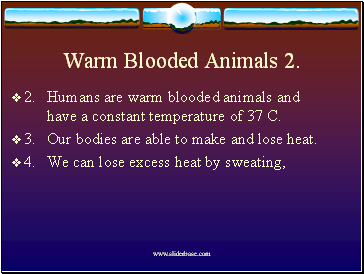 Humans are warm blooded animals and have a constant temperature of 37 C.
3. Our bodies are able to make and lose heat. 1. If your body temperature goes above 37 C, then you are suffering from a fever. 2. You tend to sweat a lot as the body tries to bring your temperature down. 3. Most increases in temperature are caused by infection. 1. This happens when the body falls below a certain temperature. 2. If the body is too low in temperature for too long, it can result in death. 3. 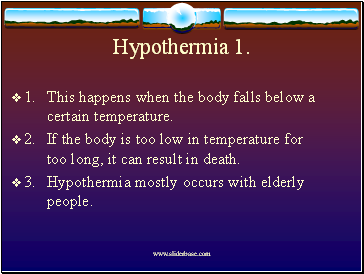 Hypothermia mostly occurs with elderly people. 4. Slow to react mentally. 1. Wrap in warm blanket. 2. Give a warm sweet drink but NOT alcohol.